What are the Newest Trends in Kitchen Cabinets and Countertops? 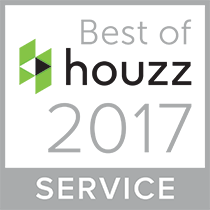 Home / Bathroom Renovation / What are the Newest Trends in Kitchen Cabinets and Countertops? 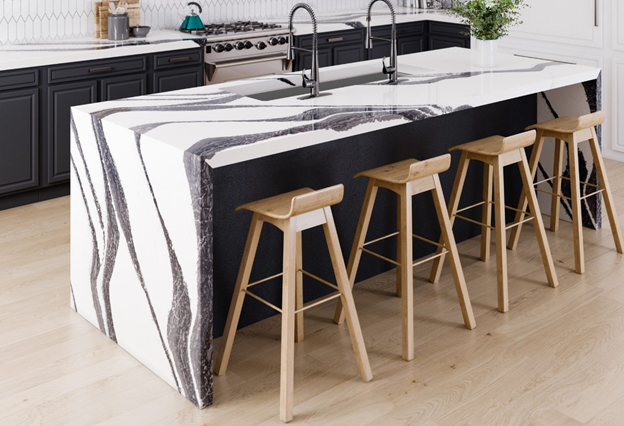 In February 2019, new ideas, products and styles for cabinets and countertops were featured at one of the largest industry events, the Kitchen & Bath Industry Show, in Las Vegas. 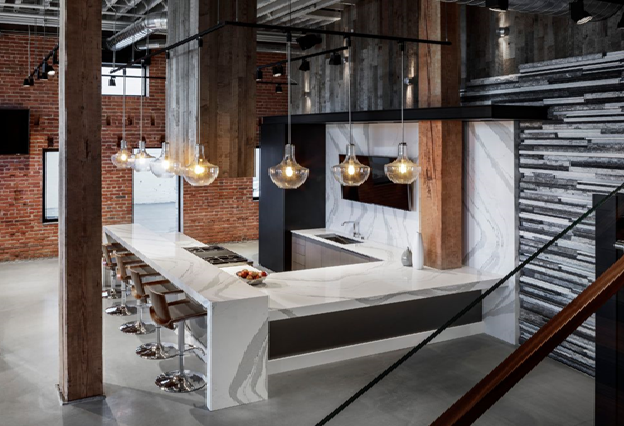 In stark contrast to white cabinets, many dark colours for cabinets and counters were on display, as well as engineered surfaces designed to emulate industrial and natural materials. We would love to hear your thoughts on the new colours and trends in kitchen cabinets and countertops. Would you consider using some of them in your next kitchen renovation project? Tell us what you think in the Comments section. Which Colours are the Most Popular Choices for Kitchen Cabinets? White cabinets are still the most popular choice for kitchen renovations, but warmer versions (including a bleached out, rustic look) are gaining in popularity. 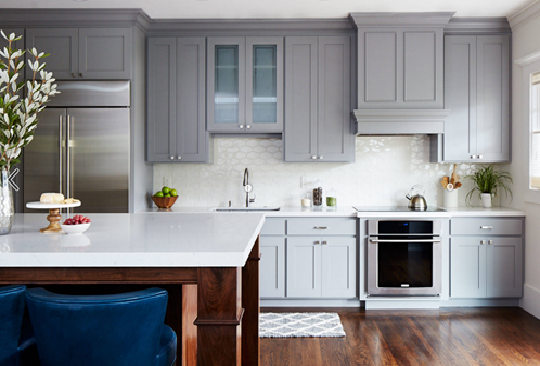 Wood and gray cabinets rank second and third by kitchen renovation customers.While it’s not in the top three, navy cabinets continue to sell well. Charcoal and dark brown are top sellers, too. What are the Most Popular Kitchen Countertop Colours? Cabinets and countertops have a tendency to match (or complement) each other, so it’s not surprising that white and gray hold the first and third position in terms of popularity for kitchen renovation projects. Multicoloured countertops came in second place. Similar to the trends discussed in countertops, navy continues to be a popular choice. Solid navy or navy-flecked counters match well with navy cabinets. Many navy islands and lower cabinets were on display at the Kitchen & Bath Industry Show. Which New Kitchen Countertop Materials are Attracting Client’s Attention? Patterns that look like wood have been popular flooring and wall application choices, but it’s definitely new to see a “wood-like” countertop! Paired with dark cabinets, it’s a striking look that definitely makes the countertop the focus of the kitchen. Corian had two different “wood-look” engineered countertop options on display in Las Vegas this winter. A number of countertop manufacturers introduced new patterns that were engineered to resemble cement. This style of countertop would work best in a contemporary kitchen with an industrial vibe. How are Advances in Technology Changing Kitchen Countertop Options? Lighting is an extremely important element in a kitchen, and there were several manufacturers who showcased backlit engineered countertop options. Backlit countertops provide a translucent effect by highlighting light taupes and beiges to create a translucent effect. If you haven’t seen one already, you will probably see an backlit engineered countertop in a friend or family member’s kitchen in the future. Wilsonart and Cosentino had several types ultrathin countertops at the Kitchen & Bath Industry Show. Inspired by European designers, these countertops are extremely thin (only 4 millimeters thick), and resemble stone, quartz, wood-look and steel patterns; these innovative designs are a new composite made of resins and paper. Cosentino had several designs made from an engineered material of glass, quartz and porcelain in their Dekton Slim line which features nine colour options. We hope that sharing these kitchen design trends help you decide which options suit you (or give you a frame of reference to find other ideas) when planning your kitchen renovation project. Please share your opinions about the newest trends in kitchen cabinet colours and kitchen countertop colours and materials in the Comments below.